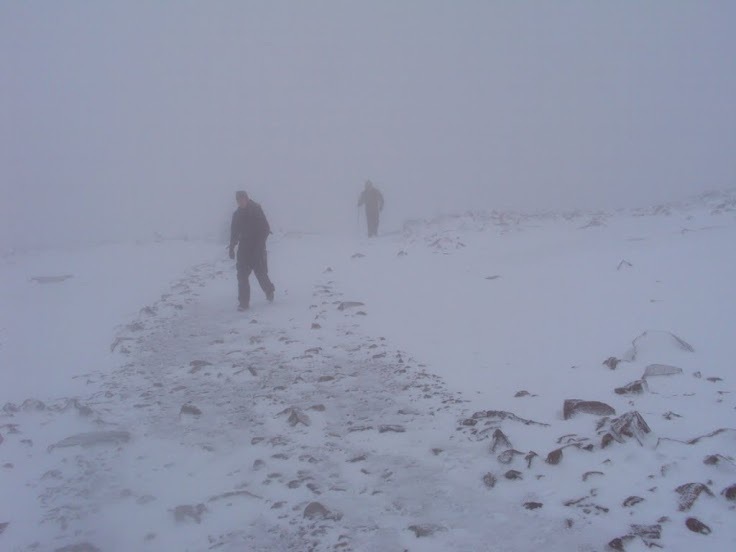 Close to summit of Ben Nevis as visibility falls. And then the world disappeared. Where seconds earlier there had been, metres ahead, a cairn all was suddenly white. Up, down, left, right, forward and back, a complete blank. My companions P and J were behind me but the fierce wind rendered shouting useless. Coordination was difficult and not simply because of the westerly headwind we were battling. Our body temperatures had also plummeted in the 15 minutes since we stepped off the summit and the blizzard had hit. Edging on through the whiteout I was dimly aware that losing the route, marked by cairns, could see us walk into the notorious Five Finger Gully, which threatened drops of hundreds of metres. We were descending from the top of Ben Nevis, the highest mountain in Britain, by the Red Burn track. It was May 24, 2011 and we were at 1300m when the blizzard blew in. It was the first time on the mountain for all three of us. Few things offer a more immediate mental and physical challenge than experiencing a whiteout. For seconds (if you’re lucky) or minutes (if you’re not) your senses are scrambled. Of the five only sight is useful – hearing, smell and touching are all drastically limited by the conditions, and taste long forgotten. Even with good navigation doubt is constantly present, not least because of the ferocious weather. Stopping, or changing course, is not an option. Faced with a situation where the ground, air and sky all appear identical and perfectly desolate – and the threat of simple white panic is blowing all around – a feeling of movement is vital. It is a foremost a test of composure, skill and physical fitness. There can be few better proving grounds for a hiker. And so you keep going. On May 24, 2011, after three or four minutes battling our way down the Red Burn, we came through. (And shot the video below). Luckily for us it was summer and the storms blowing over the West Highlands that day lacked the length and ferocity of the Scottish winter tempests. Within 20 minutes we were below the snowline, scoffing bread and chocolate and packing our away our Down jackets. Having come through even the briefest of whiteouts it’s hard not to feel grateful. Grateful that you have emerged safely but also thankful that you have experienced such a situation. ‘The risk is the lure’. 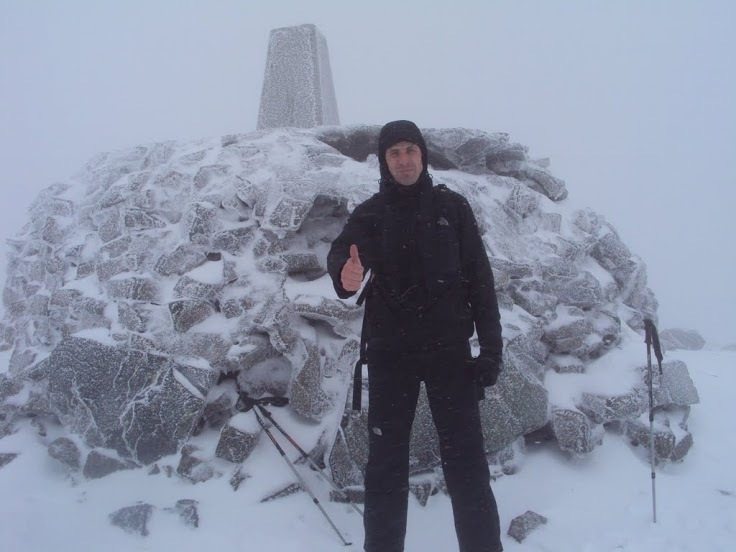 Summit of Ben Nevis (1344m), May 24, 2011. Many would argue that climbing with the risk of such conditions is reckless. But such mental and physical tests are an intrinsic part of mountaineering – though few willingly put themselves directly in the way of such events. But the risk is a lure. It’s one that seems distant in these summer weeks, when the toughest challenge facing hikers is usually cloud or rain. After I had returned home from Ben Nevis more than one pal questioned my soundness of mind for even venturing on the mountain in such conditions, concluding that I had had ‘a lucky escape’. The late Scottish writer and mountaineer Nan Shepherd provides the best response to such a view. 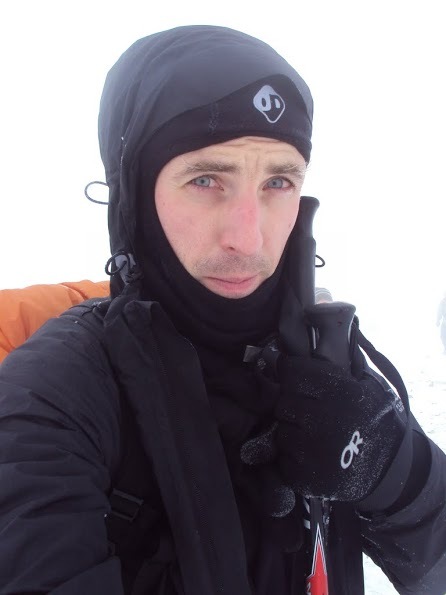 Writing about the deaths of two young hikers in a blizzard on the Cairngorm plateau on January 2, 1933, Shepherd argued risk is an inherent – and necessary – part of the mountain experience. *Nan Shepherd, The Living Mountain (Canongate Books, 2011), p 40. Bruce Springsteen, 1982, from the inner sleeve of Nebraska (Columbia Records). Ireland loves Bruce Springsteen. The bigger, the louder, the better. His shows here this week were preceded by the usual raft of gushing previews. The reviews weren’t much different. Three hours of surging, singalong, Born To Run down to The River rock, with your fist in the air and your heart on your sleeve. There’s no show like a Bruce show. The best of Springsteen is a long way from 25,000-fan sports stadiums or a neverending string of sold-out shows. Instead it can be found in recordings made in a small room at the songwriter’s home in Colt’s Neck, New Jersey, on a winter day early in 1982. On and around January 3 of that year Springsteen, weary of working in the studio, sat down his bedroom and recorded a number of songs on a Teco 4-track machine. 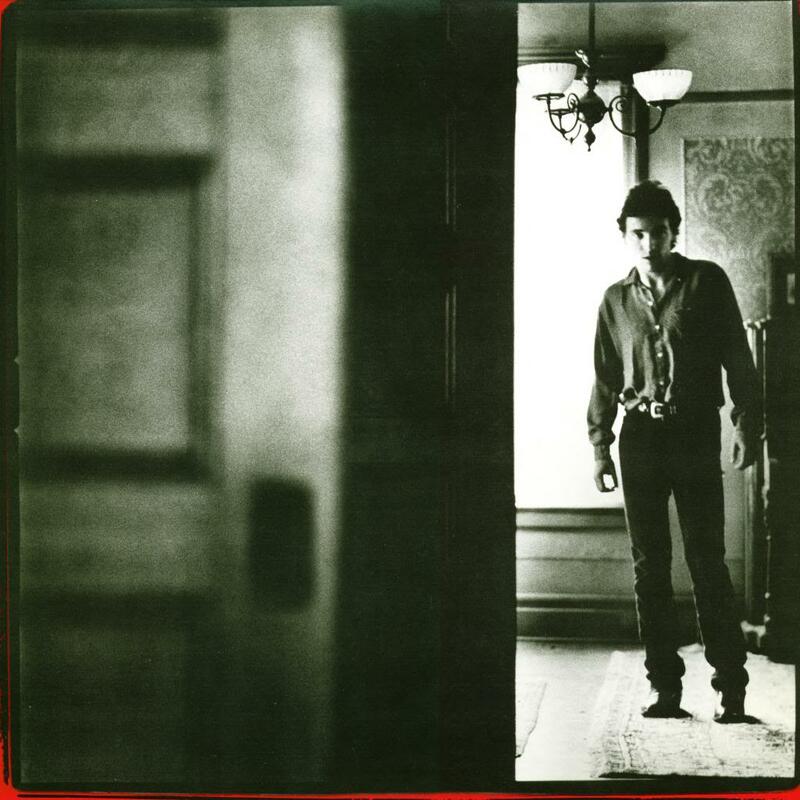 The result was the album Nebraska, a sparse, intimate recording which is the pinnacle of Springsteen’s songwriting. 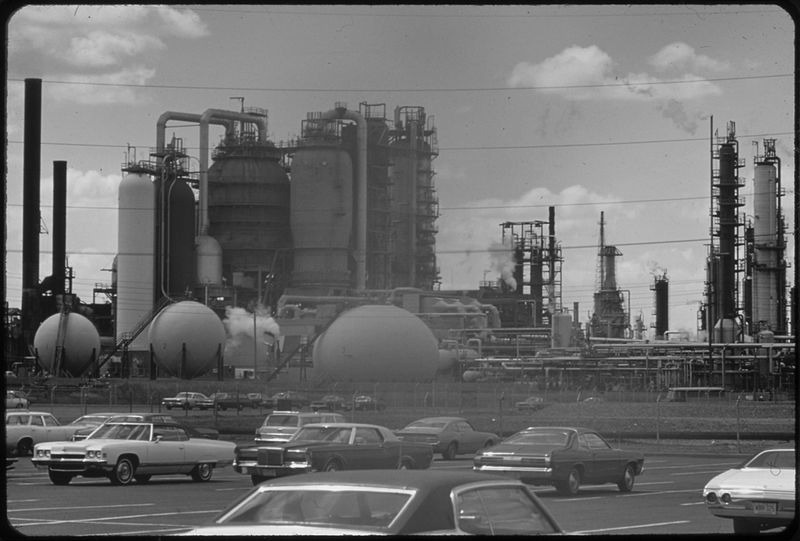 It’s an album populated with characters working menial jobs, dining in Bob’s Big Boy Fried Chicken, dreaming of a win at Atlantic City’s slots, their lives running out to a backdrop of late-century New Jersey, oil refineries and radio towers. The title song, which recounts the tale of spree killer Charlie Starkweather, is the exception. Its violence and drama is at odds with the rest of the album, where most of the events take place in private, in cars, or behind the closed, confined night-time doors of suburban Jersey. As such Nebraska is an album of limitations, a contrast to the driving surge of the Springsteen behind The Promised Land or Born To Run. Circumstances place a break on ambition for most of the songs’ characters. Lack of money or opportunity, fear, resentment, anger – these are emotions and situations strung across the album. The protagonist in the Open All Night is clockwatching on the night shift, driving past the “scrap metal hill”, factories and fields, to get home to his girlfriend. New Jersey turnpike at Linden. Salvation is listening to the radio, hoping that music will “deliver me from nowhere”. This could be the same man who appears in State Trooper, running from an unmentioned crime. Driving without a licence all he hopes for, tonight at least, is that the patrol car will pass him by. There’s an awareness of something better out there, but it’s out of reach. The singer in Mansion On The Hill lives out her days in the shade of a big house in Linden, NJ, and her life is defined by it. The mansion and the impossible dream it embodies are as permanent as the full moon which rises behind it. She’s stared through its gates as a child and, now and adult, is still looking in. The young man in My Father’s House stands on the porch of his old family home, his dad long departed, whether to the State line or the grave, we’re not told. James Gatz in a different age, he’s left staring at his departed family home, the beacon he can’t ever reach. Redemption, when it appears in Nebraska, is something rumored, hoped for. ‘Maybe everything that dies someday comes back?’ asks the departing singer who’s left for Atlantic City, before he decides to do a favour for a criminal he’s met on the boardwalk. Three decades on who knows where these characters have ended up. Still running, still dreaming of lottery win or a new car, wondering what happened to their lives. The stadium Springsteen may return to them, in various guises and at different stages as the years pass, but their voices are still heard best as they were recorded – raw, lost and alone. Why did you eat that last meal? I’ll bet your response is often linked to one of the above. But since I met my wife (and made my own first tentative ventures into the kitchen) another answer has occurred to me. I eat to travel somewhere else, or to be someone else, somewhere else. Most often I find myself opting for Italian, because cucina povera is one of our favourite cuisines and we love being in that country. 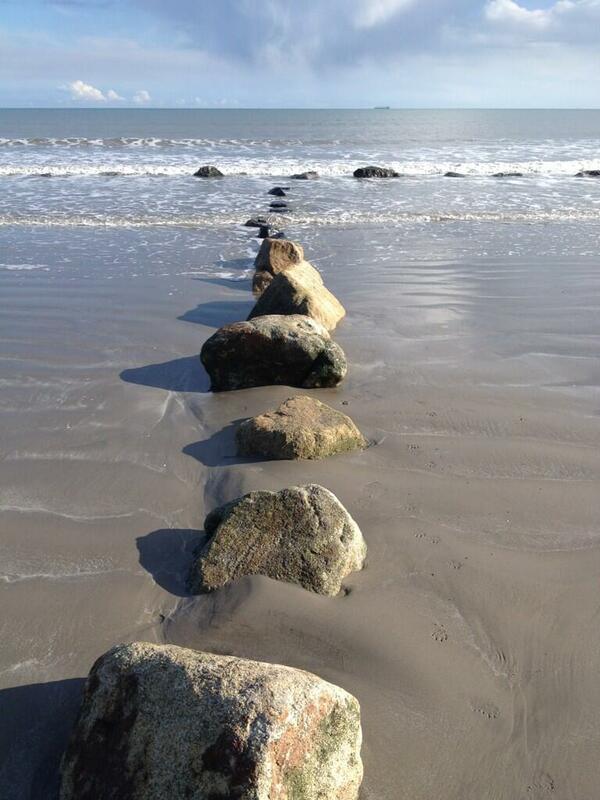 The sunshine of recent weeks in Ireland reminds me of visits we made to Italy last year. But the sun, even chased with Chianti, is not enough to transport me back there. Enter cooking. A way to return, even for us infrequent fryers. I figured the only way to get us to Italy while remaining in Dublin was to produce a meal as Italian as I could manage. Simple would help too. One question then – what dish? Chicken liver has been a poor man’s food for as long as poor men have eaten. 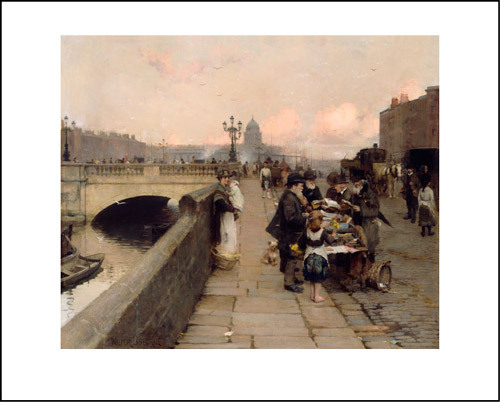 Even in overpriced Ireland half a kilogram of livers will only cost you about €3. One of my favourite chefs, Antonio Carluccio, has a recipe from the Piedmont region of northern Italy which, executed correctly, will put you in the foothills of the Alps in 30 minutes. The dish is tajarin con fegatini, thin pasta ribbons in a chicken liver sauce, popular in the town of Alba. The specifics are here. As a kitchen novice I seek out dishes that combine a maximum of authentic taste with a minimum of technical ability. Luckily it doesn’t take a great degree of culinary skill to make tajarin, which are tagliolini – a variation on tagliatelle. 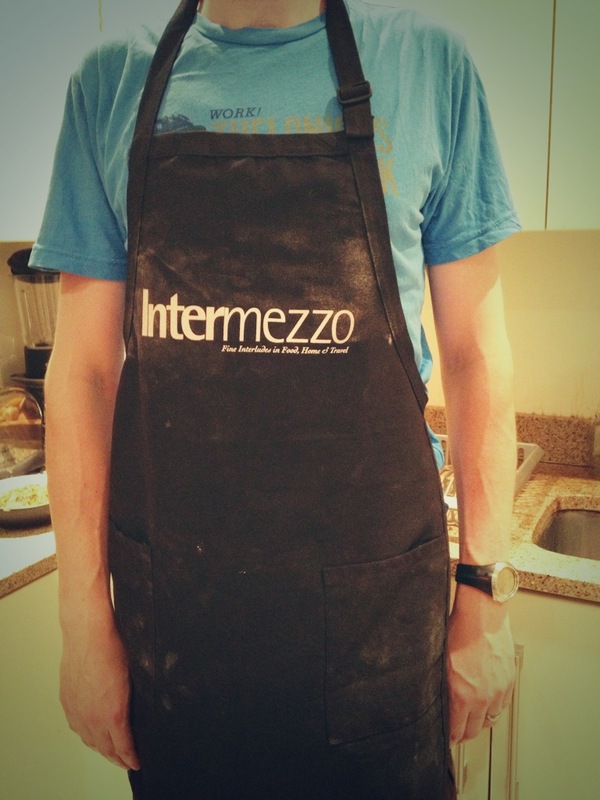 After making the pasta it’s simply a matter of getting down and dirty with the chicken livers. I’ve read that people are put off by the slimy texture and, er, unique, aroma of the offal. Alba having some of that. 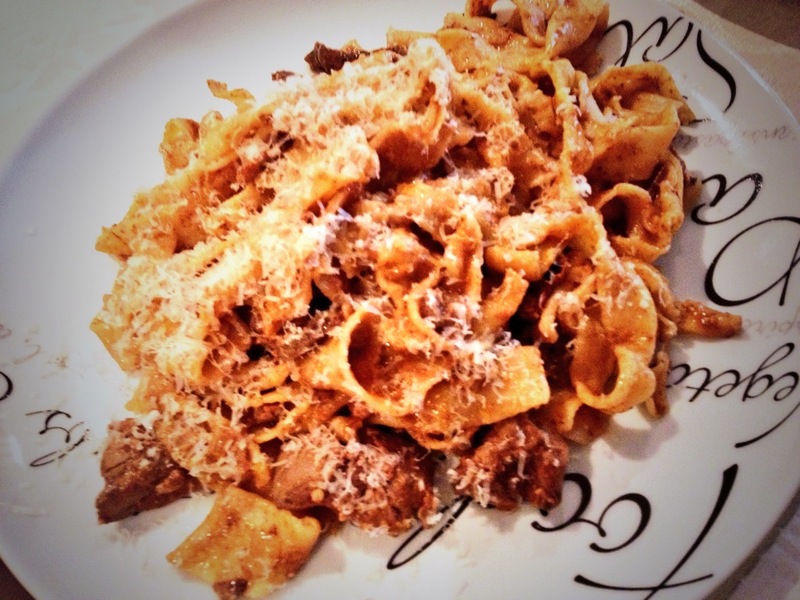 Tajarin con fegatini – pasta with chicken liver sauce. My only problem with these organs is that they’re so small (or my technique’s so unrefined) that cleaning can reduce them to mush. Last weekend’s batch came from some mighty birds, though, and held their consistency nicely. They cook in 4 minutes, in a pan with butter-browned onions and – another Italian taste ticket – porcini mushrooms. Add tomato puree and 50ml (a shot, for those who prefer to drink it) of Marsala. The latter balances out the nasal earthiness of the liver. A couple of teaspoons of truffle oil finishes the sauce, which is mixed with the tajarin and garnished with grated Parmigiano-Reggiano. The aroma hits you first. Chicken liver, porcini, truffle. Then the taste, earthy, mineral, moist. We had left our Dublin dinner-table and were sitting down to eat, halfway across Europe, in a hillside courtyard in Alba. It was proof that food is the quickest, more authentic way to travel, if don’t want to leave your apartment. Check it out. The wine was a Sangiovese though. You can’t get every local detail right. We’ll just have to go there for that.